This entry was posted on Friday, August 15th, 2008 at 4:23 pm and is filed under animals, doing it wrong, pageslaps, peeves. You can follow any responses to this entry through the RSS 2.0 feed. You can leave a response, or trackback from your own site. 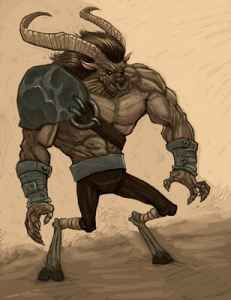 I also live beneath a Minotaur. All it took to stop the clomping was a pleasant note saying I had classes at York University until 10:00 pm, so please don’t wear heels at 6 am. I was lucky. Mebbe you could buy a pair of unisex slippers, tuck the receipt into them, and leave them outside the door? With or without a smiley face? Omg that made me laugh and pee. I had an upstairs neighbor in NYC who, I swear, took a ping pong ball every day and just dropped it to the floor, repeatedly, for hours. And it was a really specific bounce. Like a ping pong ball being, well, dropped repeatedly, for hours. Maybe it was a “Gaslight” thing meant to make me go crazy and move out so he could have my place.